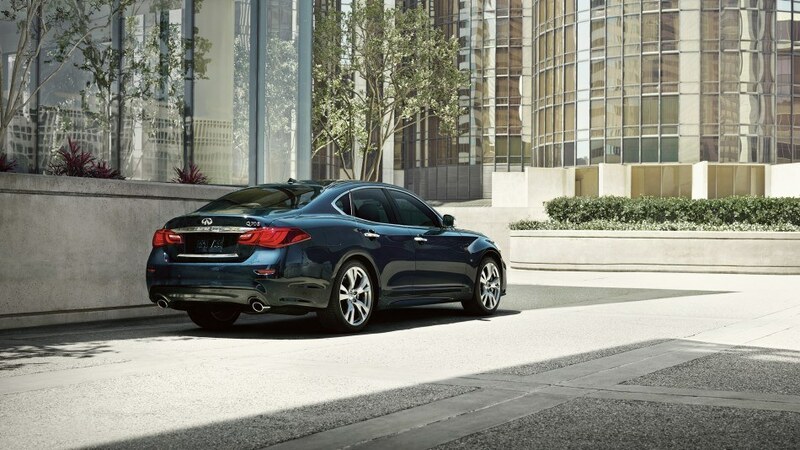 The 2017 Infiniti Q70 3.7 AWD Sport features a 3.7L 24 Valve DOHC engine with VVEL and CVTCS capable of generating 330 horsepower peaking at 7,000 rpm and a torque of 270 lb ft peaking at 5,200 rpm. 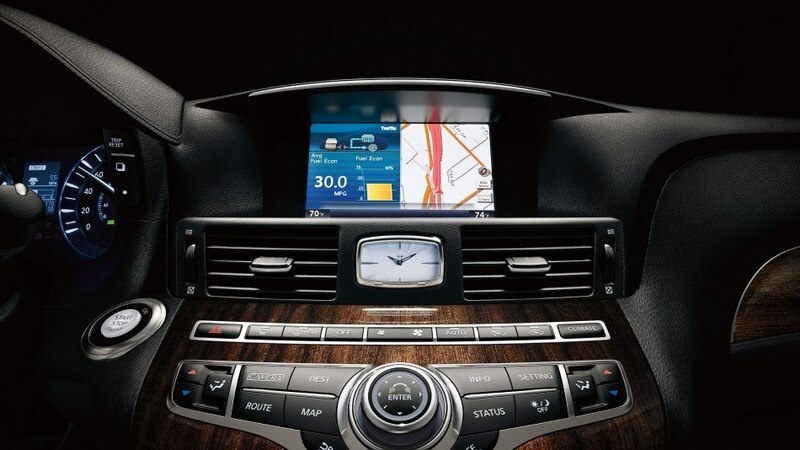 The luxury sedan has a high flow induction system and delivers 13.2 L/100Km on city roads and 9.8L/100Km on highways. The 7 speed automatic 2017 Q70 3.7 AWD Sport has adaptive shift control, four driving modes and driver adaptive learning algorithm, manual gearshifts with downshift rev matching. The Q70 3.7 AWD Sport has ventilated disc brakes on all wheels, split 5-spoke alloy wheels, all season performance tires and a spare tire. The exterior features include LED headlights with auto on and off, wiper interlock, fog lights, LED rear brake lights, comprehensive airflow management, solar glass, powered moonroof with sliding tinted glass and one touch open or close, tilt and sunshade, powered and heated outside mirrors with auto dimming and reverse tilt down, rain sensing wipers, rear window defroster, automatic trunk cincher and dual exhaust. View our inventory. The interior highlights in the 2017 Infiniti Q70 3.7 AWD Sport are leather upholsters front sport seats, Japanese Ash wood trim, 10-way power adjustable seats for the driver and front passenger, dual occupant memory, climate controlled seats for the driver and front passenger and heated steering wheel. The 2017 Q70 3.7 AWD Sport has 16 Bose speakers, active noise control, USB port, SiriusXM compatibility, audio controls mounted on the steering wheel, Bluetooth, Infiniti Controller, Infiniti Navigation, lane guidance, voice recognition, NavTraffic, Infiniti Connection, Around View and HomeLink. The driving experience is convenient and comfortable with intelligent cruise control, distance control assistance, dual zone climate control, powered locks and windows with auto lock, map lights, reading lights, storage compartment, and center armrest among others. 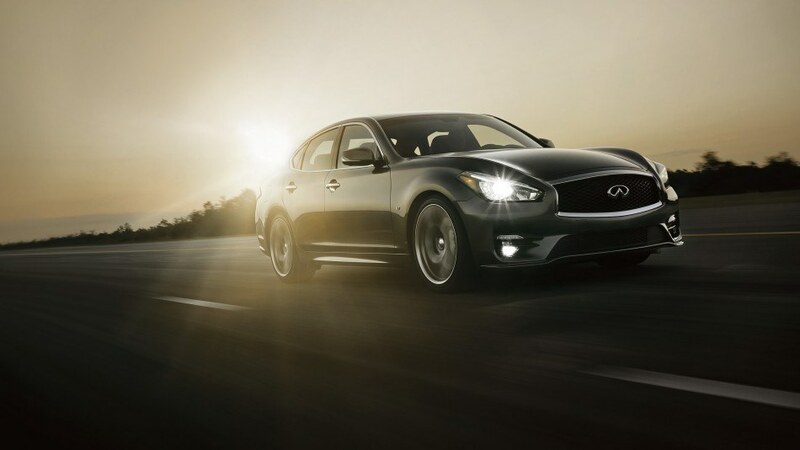 The Q70 3.7 AWD Sport has airbags in the front, mounted in the side and roof. The supplemental airbags in the front have dual stage deployment and work with the seat belt sensor and have an auto adjustment of the inflation depending on the severity of a crash. There are active head restraints for the front seats, pretensioners, load limiters, emergency locking retractor, LATCH, electronic brake force distribution, brake assist, anti lock braking on all four wheels, traction control and vehicle dynamic control, tire pressure monitoring system and auto hazard signal. The sedan also has blind spot warning, collision warning, and lane departure warning among other active and passive safety features. If you’re in the Markham or Toronto area, we invite you to book your test drive at Markham Infiniti today! View the 2017 Q70 3.7 AWD Sport on Infiniti Canada.